The Ontario Energy Board mandates all Local Distribution Companies in Ontario to provide their customers with a means to Net Meter their Hydro Consumption. Participants are allowed to supply self-generated electricity, from renewable energy sources, to Ontario’s electrical grid in exchange for credits toward their variable energy costs. One (1) credit is equal to one (1) kilowatt-hour (kWh). The value of the electricity supplied to the grid is subtracted from the value of electricity consumed from the grid and the result is the “net” difference. A net metering system should seek to “net” all variable energy costs to zero; however, the involvement of photovoltaic allow owners the relative ease of choosing the extent of their participation and expanding their system in the future. A well designed Net Metered system can provide substantial benefits to the owner while also providing a significant contribution towards Ontario's Smart Grid Goal as initiated by the Minister of Energy in 2010. Join Brian Nash, of Haliburton Solar and Wind, to learn about who’s who in the Electricity Market and how it can all come together to benefit you. In an effort to simplify my life, consolidate my interests, and lessen my environmental impact, my family and I moved to Haliburton where we designed and built a home entirely off grid. I believe in and exemplify sustainable, self-reliant, living. My passion and knowledge has led to the creation of Haliburton Solar and Wind. A company that offers full service battery based off grid and hybrid grid tied systems, using solar, wind and water power. My team focused, and collaborative approach, helps establish sound partnerships and relationships within the communities that I work. Believing in the benefits that increased community resilience can provide, I look to serve my community by volunteering for community organizations that have a direct impact on the betterment of the local population. Nov. 17th 2015 7pm at the Environment Hamilton Offices. 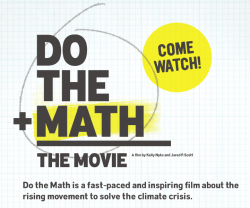 The Do The Math movie is a 42-minute documentary film about the rising movement to change the terrifying math of the climate crisis and challenge the fossil fuel industry. The film looks at our carbon budget and the implications for our pensions and savings. Our remaining global carbon budget is estimated to be 500 billion tons. As the major oil, coal and gas producers have over five times that amount in their reserves, what does it mean for the true value of these companies' shares? Some financial institutions are beginning to do the math. A presentation with Hamilton350 Don Mclean will follow. If you can not attend but would like a FREE screening and presentation for your group contact us. We are organizing a rally/march to bring attention to #COP21 talks in Paris. 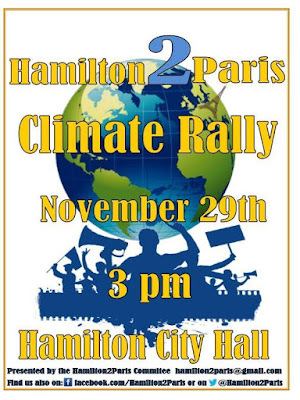 Hamilton2Paris is a grassroots initiative supported by various Non-Governmental Organizations across Hamont that want to empower and endorse ClimateAction in our city. 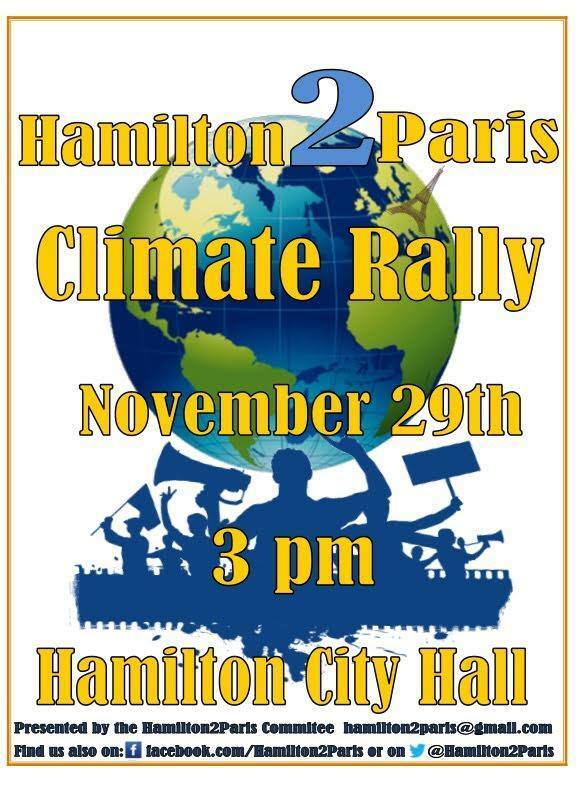 At this event, we will be nominating rally Leaders to meet at distinct places in lower Hamilton around 2:30pm, then we will begin to walk towards City Hall for 3pm in hopes to have an aerial coverage of our convergence. At this time we are hoping to have hats for everyone to wear, that are colour coordinated based upon your group's location. This is to signify Canada's position on the global stage as a country of refuge. Climate Change does play a significant role in our lives, and we need to take action to illustrate the intensity that many of us cannot fathom or begin to even imagine what others are going through across the pond. Contact Beatrice if you are a faith group, wanting to be part of the "faith contingent." 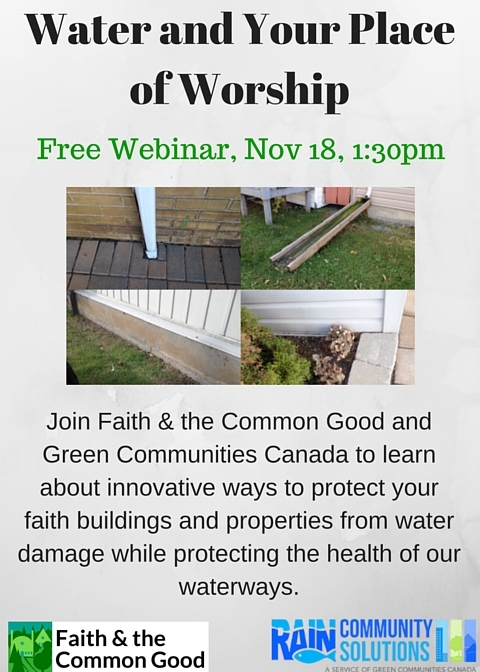 Water and Your Place of Worship: Free Webinar. Many communities are using innovative ways to protect their buildings and properties from water damage while reducing their impact on the environment. Green Communities Canada and its members have developed a suite of resources and initiatives that support individual residents, churches, schools and businesses to make changes to land and buildings, to protect them from increased rainfall events while protecting the health of our waterways. 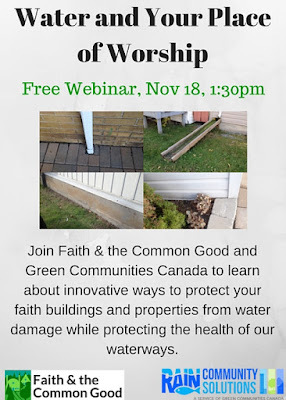 Join us for an online webinar on November 18 at 1:30 EST to learn what other communities are doing to protect their place of worship while helping to restore the urban water cycle. Hosted in partnership by Faith and the Common Good (greeningsacredspaces.net) and RAIN Community Solutions (raincommunitysolutions.ca).